Everyone hopes that their children will do/be/achieve greatness in the world. I think that's normal. I mean, we've always said "We just want them to be happy" and that's quite true. But when they hand you that baby after hours of blood, sweat and agony, they are also handing you a clean slate of possibility in the form of another human. This child, this mewling pink thing could be anything. They might invent the cure for cancer. They might be a great poet. They might be the world's greatest car thief. You don't know what they will be - but the possibilities are endless. They are endless until you learn your child has a disability for which there is no cure, no end, and no meaningful improvement from. Then you learn to set your sights lower, reduce the scope of your dreams, and be happy for what you have. We used to say that Charlie would be a pilot, when he was a toddler. He LOVED planes - still does. He loved them the way my brother Matt loved trains. We'd laugh, "Charlie will fly helicopters. Charlie will fly planes one day." It was a little meaningless game all parents play. It was heartful, and happy and silly. It was also dead wrong. Charlie will never fly a plane. Unless it's some sort of death plane - he'd be fine at flying at that. My twin boys will likely live our their lives with me and their father and some day have to live in some sort of a home unless their siblings have the means to afford some one to help care for them in their own home. They won't write literature, fly planes, cure disease or create anything lasting on this earth. But they will have been loved, and safe, and happy. That's as good as I can ever hope for. If we get more than that on any day, I will count it good fortune and be grateful. I won't give up hope for improved treatments or therapies for them, but I also won't live my life waiting for them. I accept that this might be it. They might be EXACTLY like this until the day I die. That's ok if that's how it is. They're invisible on the earth. I see them, but the world really won't ever see them or regard them. There won't be people who remember them fondly except our immediate family, no people who look up to them, or regard them as peers and comrades in arms. They're singular, each alone even as they are together. Imagine my surprise when last night we reviewed papers from school and this was in Miles work. This month we are studying about peacemakers. We were taught about how you were a peacemaker. I want to thank you for your work in domestic and foreign affairs.. You gave people hope. 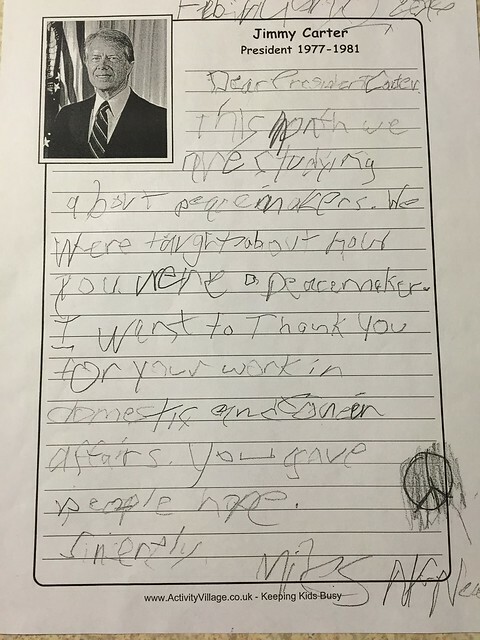 His class all wrote letters, and they were taken to former President Carter...and READ TO HIM. Now, I'm positive he had some help writing the letter as I can't recall the last time Miles brought up DOMESTIC AND FOREIGN AFFAIRS. Jimmy Carter heard a letter written by my Miles. Jimmy Carter, former president, Nobel Peace Prize Winner, heard a letter written by Miles. I literally burst into tears when I learned this. My invisible child was heard by him. He probably won't remember, it was probably one of 50 letters from Special kids he heard that day. That doesn't matter. One of the most important figures of the late 20th century (whether you life him or not) heard of my child. It is something I would never have dreamed was possible. It makes me happier than I can ever explain, unless you have a disabled child yourself. In that case, I know you understand.